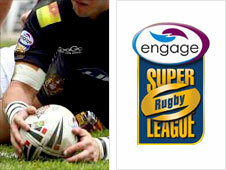 The Super League Show is on Sunday, 3 April 2011 at 1800 BST on BBC1 (North; North West and North East Regions only). Tanya Arnold and the team have all the highlights from round eight of Super League XVI and discuss all the latest news from the game. The show will look back at Salford against Crusaders from Saturday night, and Friday night's games: Hull FC v Castleford; Leeds v Wigan; St Helens v Hull KR. Sunday sees Bradford host Harlequins; Huddersfield v Wakefield; Warrington v Catalan Dragons. The programme will be repeated on Monday, 4 April at 0435 BST on BBC2 and can also be viewed on the BBC iPlayer throughout the week. If you have not already, join the Super League Show Facebook group and the show's newsletter for free.